The Holy Cross-bound senior led Newton North to a 20-0-2 record and its first Division 1 state title since 1999. She scored 11 goals and dished eight assists in her role as attacking central midfielder and earned All-America honors. The four-time Northeastern Conference All-Star led the state in scoring with 48 goals and 13 assists, bringing her career total to 138 goals and 42 assists for a school-record 180 points. The All-New England forward will play soccer at Holy Cross next year. A senior captain, Leahy was the backbone of a defense that allowed just six goals in 23 games. The center back was named EMass Division 3 Player of the Year and finished her career with 10 goals and 10 assists. Randolph led the Cougars to a 15-1-2 regular-season record and its first tournament appearance in 14 years. Her team-leading 13 goals and 15 assists earned her Catholic Central (Large) All-Star and EMass All-Star accolades. Adams, a forward, scored 36 goals in her freshman season at Waring and was named the IGC MVP. Adams is a three-sport athlete, playing basketball in the winter and lacrosse in the spring. Caputi tallied 14 shutouts and allowed six goals to help Tabor finish as co-champions of the New England Class B Prep School Tournament. She finishes her career with 23 shutouts and a 36-1 record. She will attend Bowdoin College. The three-time Hockomock League All-Star led the Panthers to their second straight Division 1 South title. She scored in four straight playoff games, including a goal and an assist in the 2-1 South final. The Middlesex Conference Player of the Year, Curley led the Wildcats to a 10-0 league record and the Division 2 state final. The senior captain’s talents at center midfield brought her EMass All-Star and All-State recognition. The senior captain allowed just eight goals for a 0.4 goals-against average, helping the Patriots to the Division 2 North final. An All-New England goalie, DeBruzzi boasts 29 career shutouts and a 0.87 GAA. 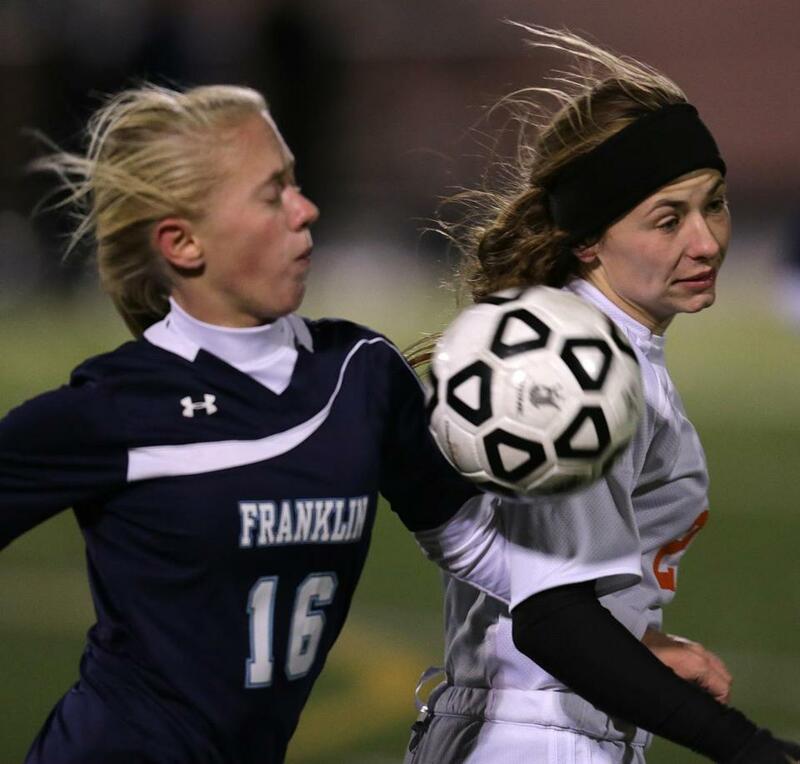 The two-time All-State striker scored seven postseason goals, including two game-winners, to help the Tigers capture the Division 1 state championship. A four-year varsity player, she had 29 goals and 13 assists her senior season. Ham was the ISL Offensive MVP and earned All-New-England honors after scoring 59 career goals. A high honors student, Ham also plays basketball and runs track, and will play soccer for Bucknell next fall. The junior from Rehoboth finished with 29 goals and five assists, giving her career totals of 65 goals and 23 assists. The EMass All-Star led the Shamrocks to the Division 1 South final and a 17-3-2 overall record. The senior captain from Plymouth scored the winner in the Division 2 South final as well as the winning penalty kick against Wilmington for the state title. The All-New England striker had 36 goals this season. King was the EIL MVP after finishing with 21 goals and 14 assists. A two-time captain, she earned all-league honors four years in a row. She tallied 56 goals and 35 assists for her career and will play soccer at Amherst next year. Lehan was the Defensive Player of the Year for the second year in a row, and earned All-American, All-New England, and All-State honors as Rivers was New England Class B co-champions. The honors student has verbally committed to Brown. McCauley, a team captain, scored 50 goals and dished out 17 assists for the NEPSAC Class D champions. She tallied 195 goals and 70 assists in her career and will attend Yale next year. The junior’s winning goal in a 1-0 victory over undefeated Central Catholic gave the Colonials a chance to play for the Division 1 North title. The All-New England midfielder finished the season with eight goals and five assists. A three-year starter, the junior led the Rockets to a 12-2-7 finish and the Division 1 South semifinals. The midfielder earned Bay State League All-Star, EMass All-Star, All-State, and All-New England honors. The Boston University commit anchored a defense that recorded 17 shutouts and averaged 0.28 goals-against this season. The All-State defender contributed three goals and five assists to help the Colonials reach the Division 1 North final. The senior captain scored the winning goal in the Division 3 state final, capping a 20-goal, five-assist season. She finishes with 38 goals and 22 assists, making her the Clippers’ sixth all-time leading scorer. The senior captain from Windham led the Raiders to an 18-0 regular-season record. The first-team EMass All-Star had 15 goals and 11 assists en route to being named Merrimack Valley Conference Player of the Year. White took the Chieftains to (15-1-5) to the Division 1 North semifinals and led the Cape Anne League in scoring with 29 goals and 15 assists. The EMass All-Star plans to play for St. Lawrence next fall. In his fifth year as head coach, Hamblin guided Newton North to an undefeated season and the Division 1 state championship. The Tigers (20-0-2), who outscored opponents, 61-10, came through in big moments and exhibited class and composure throughout the playoffs. The former All-American from Rockland High brought the same passion and dedication to the sidelines as her players brought to the field. In her seventh season, Lima coached the Cougars to a 21-2 overall record and the Division 2 state title. The third-year varsity coach steered the Cougars to a 19-2-3 record, the best in program history. After making the tournament for the first time in 14 years, the Cougars won the Division 4 EMass crown. The 21-year veteran coach helped lead Newburyport to its first Division 3 state championship since the Clippers won back-to-back titles in 2007 and 2008. The Clippers’ 21-0-2 record is the best in program history. Sheridan joined Gonnam as a co-coach in 2010 when Newburyport’s 10 graduating seniors were freshmen. In the last four years the Clippers have gone 64-11-11, capped off with a Division 3 state title this year. Atlantic Coast — Falmouth: Madison Scavotto. Marshfield: Abigail Clapp, Laura Cowie-Haskell, Kassidy Fleming, Michaela Pitts, Jill Talanian. Nauset: Carolyn Brooks, Abby Sullivan. Plymouth North: Isabelle Lapsley, Brianna Malaguti, Hannah Petersen. Plymouth South: Jayci Andrews, Rachel Melisse, Holly Sessler, Maddie Sessler. Sandwich: Lea Adams, Maddie LaRochelle, Becca Mandy, Caroline McKenna. Bay State — Braintree: Sinead O’Callaghan, Allyson O’Rourke. Brookline: Lindsay Westlake. Dedham: Andrea Bradbury, Libby Masalsky, Emily Pike. Framingham: Olivia Bernas. Milton: Sophie Cousineau, Claire Mahoney. Natick: Haley Reddish, Carly Wilkins. Needham: Emily Bowers, Emilie Despres, Kira Oberle, Kayla Steeves, Natalie Wong. Newton North: Christina Callahan, Shannon Fitzgerald, Katie Nugent, Angela Ward. Walpole: Abby McMackin, Lauren Regan. Wellesley: Sabina Hartnett, Kyleigh Wells. Big Three — Brockton: Jennifer Caruso, Maral Merian, Hailey Miller, Nerida Montrond, Lauren Sever, Ariana Silvia. Durfee: Tori Borges, Jordyn Gauvin, Isabel McDonnell, Gaelen Riley. New Bedford: Alanna Garcia, Lucy McDowell, Cassie White. Boston City — Boston English: Cesaltina Barros, Kristina Colon, Kenya Reyes. Brighton: Brianna Alves Gomes, Meybel Lopez Flores, Amanda Melo. Burke: Deahjah Gardner, Aliica Lima, Tamara Rodgers. Charlestown: Hodan Ahmed. CASH: Jennifaire Luche, Kyla Simmons, Deshanique Tarkpor. Dorchester: Sandy St. Felix, Kaylin Thomas. East Boston: Hannah Lunetta, Vanessa Mejia Figueroa, Pamela Sepulveda. Latin Academy: Bernadine Conklin, Fatma Hussein. Madison Park: Berlizia Brito, Sara Dos Santos, Andrea Lopez. New Mission: Alison Davey, Rodas Ghidei, Amarielis Morales. O’Bryant: Misgana Alemu, Yonetta Harris, Keena Nicholas. South Boston: Suraia Silveira, Daitannah Smith. West Roxbury: Hirmine Francois, Hiba Kifl, Monique McPherson. Cape & Islands — Cape Cod Academy: Lily McGrath, Olivia Mead, Olivia Rand. Cape Cod Tech: Kiah Gomes. Nantucket: Kate Daniels, Isabella Day, Mya Kotalac, Claire Mackay. Pope John Paul II: Alexandra Cornwall, Katherine O’Brien. Sturgis East: Brittany Gayton. Sturgis West: Stephanie Crowley. Cape Ann — Amesbury: Amanda Martin. Georgetown: Jennifer Migliaccio. Hamilton-Wenham: Carolyn Cook, Suzanne Rose. Ipswich: Katie Monahan. Lynnfield: Sam Filipe, Emily Scollard, Jackie Whelan. Masconomet: Paige Pratt, Kaleigh White. Newburyport: Carly Brand, Abbie Bresnahan, Lilly Donovan, Alyssa Leahy, Jaycie Triandafilou. North Reading: Kerri-Ann Donovan. Triton: Morgan Snow. Catholic Central — Archbishop Williams: Heather Banks, Jess Rega. Arlington Catholic: Haleigh Butler, Jennifer Corso, Melissa Rogers, Kaila Sullivan. Austin Prep: Julie Barthelmess, Meghan Braciska, Mia Karras, Kristin Randolph, Madison Shaw. Bishop Fenwick: Mary DiFilippo, Ellen Fantozzi, Merry Harrington, Jenny Nasser. Cardinal Spellman: Lily Demers, Adrianna Forcucci, Emily Roan, Christina Schneider, Julia Schneider, Brianna Steeves. Cristo Rey: Jenna Marcocci, Elizandra Pereira. Lowell Catholic: Brianna Fiorentino, Courteney Lanier, Julia Mancini, Maddie Medina, Taylor Patterson, Lexi Petzold. Marian: Anne Budra, Alexandra Fantasia, Antonia Fantasia, McKenzie Sparling. Pope John: Julia Bosco, Sarah Chen, Maggie McCormack, Kim Tran. St. Clement: Taisha Dupre. St. Joseph’s Prep: Danielle Civitarese, Maryellen Robinson, Aria Ross, Rachel Sansone, Fatima St. Hilaire. St. Mary’s: Sophia Homes, Jennie Mucciarone. Catholic Conference — Notre Dame (Hingham): Gabriela Kenyon. Commonwealth — Chelsea: eLIZA Erazo, Francis Teruel. Greater Lowell: Amanda Gage, Chelsea Hall, Andrea Ramirez, Patricia Ramirez. Lynn Tech: Coral Gonzalez, Brenda Guevara. Minuteman: Kiley Drop, Emily Pierce, Rebecca Pierce. Mystic Valley: Alex Cimetti, Katarina DiPlacido, Meghan Foley, Feliciana Panza, Samantha Rizzo. North Shore: Keely Gallagher, Makayla Norden, Sarah Powers, Ava Swiniarski. Northeast: Courtny Norton, Christina Sicari. Notre Dame (Tyngsborough): Deanna Desmond, Hannah French, Madison Odryna. Presentation of Mary: Abby Myers, Kayla Pacenka. Shawsheen: Emily Irwin, Janina Kennedy, Davien Lavino, Rachel McLaren, Lynne Snook. Dual County — Acton-Boxborough: Julia Coleman, Shannon McMillan, Alexandra Spangler, Pietra Sweeney, Kaylee Sye, Maddie Walsh. Bedford: Maya Biswas, Julie Hamilton. Concord-Carlisle: Molly Adams, Allie Barrett, Maggie D’Eramo, Angela DeBruzzi, Abby Gramaglia, Molly Whitman, Meg Wilson. Lincoln-Sudbury: Eliza Guild, Caitlin Hullinger, Leah McCullough, Hannah Rosenblatt, Kate Spiegel. Newton South: Tamar Bulka, Kat Cullen, Sophie MacArthur. Waltham: Amanda Concetti, Talia Frazier. Westford: Samantha Hyslip, Emma Katz, Lauren Steele, Meghan Thomasch. Weston: Lane Cronin, Tally Shea. Eastern Athletic — Bishop Feehan: Shelby Hogan, Maddie Jolin, Ally Luongo, Alexandra Poirier, Samantha Ross. Bishop Stang: Alexa Ferreira, Casey Meissner, Vanessa Oliveira, Andrea Rego. Coyle & Cassidy: Kiley Adams, Lauren DeSousa, Carrie Hamelin. Martha’s Vineyard: Isabelle Wadleigh. Somerset Berkley: Kara Bothelho, Alaisha Teixeira. EIL — Beaver Country Day: Lindsay Bouscaren, Sophia Friedfertig. Berwick: Brooke Downey, Caroline Hernon, Kaitlyn Wurzer. Concord Academy: Louisa Dodge. Dana Hall: Emily Dumont, Taryn Jacoby. Lexington Christian: Caroline Niland, Kesha Porter, Shae Roys, Courtney Teehan. Newton Country Day: Elizabeth Marano, Megan Rogers, Sarah Spellman. Pingree: Charlotte Esty, June Kiely, Kasey Provost, Kerri Zerfoss. Winsor: Jenna Gustafson, Taylor Lynn-Jones, Delancey King. Greater Boston — Cambridge: Shiann Gardner, Anna Klug, Imogen Nelson, Kristen O’Loughlin. Everett: Marilyn Duarte, Sheryl Steeves. Malden: Sabrina Baretto, Lea Haehnel, Felicia Lombardi. Medford: Olivia Allison, Regine Jacques, Alessia LaRocca, Adrienne Porrazzo, Bruna Silva. Somerville: Melissa Baptista, Rachael Berry. Hockomock — Attleboro: Brianna Laplume. Canton: Hailee Duserick, Kim McNally. Foxborough: Kristen Bortolotti, Danielle Roma. Franklin: Taylor Cogliano, Nicole Ellin, Bailey Knous, Jane Scafati. King Philip: Audrey Fox, Haley Keegan. Mansfield: Melissa Bongarzone, Abby Broyles, Molly Sheild. Milford: Erika Figuero, Julia Masionis. North Attleborough: Nicole Chretien, Jill Costello, Laura Patruno. Oliver Ames: Delaney Benton, Francesca Calebrero, Kate Holleran, Shannon Holleran. Sharon: Emma Blau. Stoughton: Rachel Berkowsky. Taunton: Kayla Wentworth. IGC — Brimmer & May: Chardon Brooks, Kristin Gates. Cambridge Weston: Sophie Hess, Jackie Holmes, Naomi Meiselman. Chapel Hill: Lexi Knowlton-Simard. Gann Academy: Ilana Schecter, Nikki Teperman. Landmark: Molly Naser. Waring: Amanda Adams, Brooke Adams, Merilyn Hinrichs, Eleanor Lustig, Audrey Sheetz. Woodward: Feenish Mulkerrins, Julia Wells. ISL — Brooks: Jinx Charman, Kate Donovan, Isabella Papapetros. BB&N: Maeve McNamara. Governor’s Academy: Jackie Ham, Kendall Ham. Groton: Sydney Brackett, Dorrie Varley-Barrett. Lawrence Academy: Shannon Johnson-Finn. Middlesex: Shannon Ryan. Milton Academy: Chandler Quintin, Nicola Young. Nobles: Julianna Chen, Lauren Dillon, Beth Kamphaus. Rivers: Meghan Lee, Maclaine Lehan, Maggie McCabe. St. George’s: Sarah Boule. St. Mark’s: Royce Light. St. Paul’s: Madison Crutchfield. Thayer: Kali Denty. Mayflower — Avon: Nicole Berry, Maggie Duggan, Kayla McKenny. Bishop Connolly: Sarah Matrisciano, Kelsey Oliveira, Meghan Stimpson. Blue Hills: Meg Delaporta, Bryanna Eklund, Shardae Lobo. Bristol-Plymouth: Laura Ellis, Kristen Lees, Kayla Ryan, Alana Vincent. Diman: Sabrina Costa, Alexis Cote, Ashley Ferreira, Lacey Perry, Cara Pimentel. Holbrook: Ceara Kelly. Norfolk Aggie: Abby Ames, Kelly Couite, Lily Rielly, Shelby Silvia. Old Colony: Alex Aspden, Briana Botelho. Sacred Heart: Moira Gattoni, Bridget LeBlanc, Kelly O’Donnell, Allie Pasquale. Southeastern: Neyshmarie Alicea, Amberly Mendes. Tri-County: Kelsey Maynard, Lindsey Parent. Upper Cape: Krystle Dibona, Sierra Roberge, Jodie Young. West Bridgewater: Nicole Jorritsma, Emily Quinn, Francesca Sheedy, Brooke Wojciechowski. Merrimack Valley — Andover: Veronica Alois, Sarah Van Antwerp. Central Catholic: Erin Berube, Stephanie May, Kylie Regan, Aly Spencer, Courtney Walsh, Alli Wiggins. Chelmsford: Patricia Blumeris, Rachel Hanna, Kayla Loycano, Mary Lupoli. Haverhill: Marlayna Buco, Kelleigh Cokely. Lowell: Leyshla Gonzalez. North Andover: Abbie Karalis. Middlesex (Freedom) — Burlington: Emily Han, Arian Rivera. Stoneham: Samantha Gendall, Alessandra Molinaro. Wakefield: Nicole Galli, Grace Hurley, Kristina Redmond, Amy Shea. Watertown: Shannon CaFua, Casey Halle, Luara Nieske. Wilmington: Kaitlyn Curley, Cassie Grasso, Devyn Malatesta, Rachel Mara, Christina Spinos. Middlesex (Liberty) — Arlington: Katjia Dunlap, Gabi Galvin, Sabrina Morais, Ellie Parravano. Belmont: Lizzy Frich, Lucia Guzikowski. Lexington: Ellie Clayton, Caroline Forlenza, Reid Nichols, Ali Ruxin. Reading: Gabriella Coppola. Winchester: Sophie Barlos, Nina DeLellis Mitch, Emily Price. Woburn: Nicole Cronin, LeAnn DiMauro, Nicole Pacheco. NEPSAC - — Boston Trinity: Sarah Mawhinney. Brewster Academy: Elizabeth Lane. Chase Collegiate: Sarah McCauley. Cheshire Academy: Amanda Montano. Choate: Caitlin Farrell. Deerfield: Mercedes Fissore-O’Leary. Ethel Walker: Veronica Garcia. Forman: Ashley Bottis. Greenwich Academy: Helen Dempsey. Hamden Hall Country Day: Maya Harlan. Hopkins (Conn.): Dana Monz. Hotchkiss: Elizabeth Wuff. Kimball Union: Shannon Walsh. Kingswood-Oxford: Julia Lantieri. Loomis Chaffee: Danielle Snajder. Marianapolis: Kayla Bolduc. Montrose: Olivia Aha. New Hampton: Jayne Lewis. Phillips Andover: Hannah Guzzi. Phillips Exeter: Danielle Sim. Pomfret: Rhone O’Hara. Proctor: Jamie Dee. St. Luke’s: Salma Anastaci. Suffield: Emma Tryon. Tabor: Lydia Caputi. Taft: Maddie Leidt. Waring: Amanda Adams. Westminster: Laura Moore. Wheeler (R.I.): Nellie Congdon. Wilbraham & Monson: Christina Wakefield. Williston Northampton: Gia Parker. Wooster: Blair Hamilton. Worcester Academy: Caroline Kelleher. Northeastern — Beverly: Casey Cook, Diandra Crowley, Caitlin Harty. Danvers: Erin Loehner, Kylie Plaza. Lynn Classical: Frankie Galeazzi. Marblehead: Mia Bongiorno, Kelly Mealey. Peabody: Madison Doherty, Caitlyn Lodi. Salem: Alix Bryant. Swampscott: Mackenzie Rob. Patriot— Duxbury: Gabbie Davis, Emma Gill, Logan Snelling, Molly Tobin, Emily Weimer, Meghan Zaverucha. Hanover: Karly Atturio, Emma Hoffman, Liz Ward. Hingham: Carly Baggott, Ashley Harkins, Eve Hewins, Julia Patterson. Middleborough: Olivia Nicholson. North Quincy: Courtney Campo, Marissa McGue. Pembroke: Katie LeMarre, Mika McIsaac, Alex Schaffer, Juliane Watts. Quincy: Emma Papile. Scituate: Erika Badger, Eliana Buckley, Megan James, Orianna McDonough, Corey Murray, Marlena Reidy. Silver Lake: Abby Ford, Kayla Gomes, Katie Griffin, Alicia Wohlgemuth. Whitman-Hanson: Hayley Bukow, Lauren Clark, Kelsey Gilbert, Lily Higgins, Marina Kelly. South Shore — Abington: Marianna Porcello. Carver: Kerri Alexander, Allie Guimares, Sami McGrath. Cohasset: Emmy McGoldrick, Emily Rosano. East Bridgewater: Rianna Fasanello, Brandi McDonald, Sarahkate Norton, Brooke Troup, MacKenzie Vlachos. Hull: Alaina Bennett. Mashpee: Rachel Bridges, Jackie Lynch, Shannon McGovern. Norwell: Emma Basso, Sara DeBenedictus, Sarah DeGregorio, Morgen Gallagher. Rockland: Lauren Farrell, Julia Matson, Jenna Novio. Tri-Valley — Dover-Sherborn: Caitlin Balmer, Jacquline Goudreault, Claire O’Callaghan. Holliston: Kylie Lorenzen. Medfield: Cammi McGourty, Lauren Petit. Medway: Shannon Aviza, Shannon Simmons. Millis: Allysa Fallon. Norton: Ashley Cibotti. Westwood: Ela Hazar.